Hosea P. “Hod” Clements, son of Ann Eliza Swindle and John Miles Clements, was a life long resident of Berrien County. He was a cousin of the Clements brothers who ran the Clements Lumber Company at Ray City, GA. Hod was educated at the Georgia Normal College and Business Institute, and served in France during WWI, but always returned to Ray City. On September 15, 1917 Hod P. Clements married Alma Florence May in a ceremony performed by A. J. Futch, Minister of God. Alma was a daughter of Mary Florence “Molly” Simmons and Sirmon Green May. 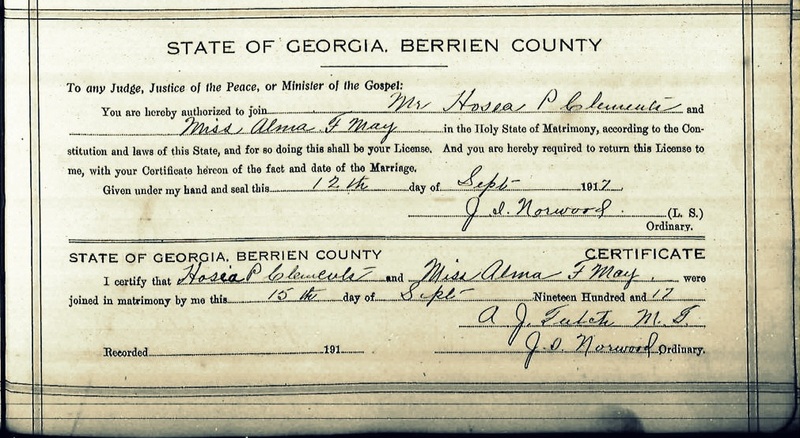 Her father was a farmer at Nashville, GA .
Hosea Peeples “Hod” Clements and Alma Florence May were married in Berrien County, GA on September 15, 1917. The following year Alma gave birth to their first child, James Herman Clements, born May 8, 1918. As told in the previous post (Hod P. Clements and the Dixie Division ), Hod joined the army and shipped overseas late in the summer of 1918 where he served from September 17, 1918 to July 5, 1919. 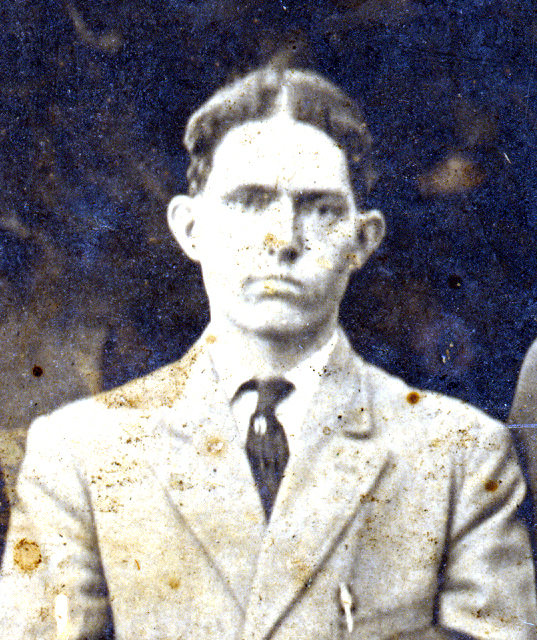 James Herman Clements, son of Alma Florence May and Hod P. Clements, circa 1921. Image courtesy of berriencountyga.com. James Herman Clements and Mildred Lorene Clements, children of Alma and Hod P. Clements, with Marie and Pete Studstill. Image courtesy of berriencountyga.com. The Clements were involved in the community. Hod Clements was a Master Mason, raised up January 8, 1935, and a member of Duncan Lodge. Alma Clements was a supporter of local education and in 1941 she was working in the lunchroom at the Ray City School. In the 1940s the Clements home on Jones Street was valued at $1000. Hod and Alma lived there with their children, James Herman Clements, Mildred Lorene Clements, and Helen Frances Clements. Also boarding in the Clements home was James Gaskins Grady. Grady was a school teacher who had come to Ray City from Montevallo, AL some time after 1935. The Clements’ neighbors on Jones Street were James M. Studstill, who was the uncle of Vera R. Yawn, and great uncle of D’ree, Allene, and Caswell S. Yawn. Another neighbor was Thomas J. Studstill, and a few doors down were Chester Nobles, Billy Creech, and J. H. P. Johnson. Hod worked 60 hours a week, 50 weeks a year, employed as the manager of a meat market. For this he earned $30 a week, $1500 a year. In 1948, buying the old Ray City Bank and its equipment for $3,500 he opened The Bank of Ray City , a private bank and the only financial institution in the town at that time. Obtaining a state charter in 1949, H.P. Clements began banking with a capital of $10,000. In 1956, Mr. Clements’ son-in-law, Lawson Fountain, returned to Ray City, from Jacksonville, FL and afterwards the two ran the bank together. In later years Mr. Clements was forced to retire due to ill health. Then in 1973 the bank was sold to the Citizens Bank of Nashville. Georgia, and is now the Ray City office of that bank.